I have to write a positive review about the video podcast “Ask A Ninja“, or I will be attacked, maybe killed by a silent sword-wielding Ninja. My family will never be safe. Even the dogs will be threatened. It’s a good thing I love “Ask A Ninja”. Each episode is filmed in an L.A. apartment and starts off with the wonderfully catchy theme music “I Am Ninja“, performed by the German pop band The Neu Tickles. The show lasts about 3 minutes and features the mysterious Ninja in front of a plain, colored background, generally without props. He speaks in an authoritative, husky voice, makes emphatic sharp-witted and often funny declarations about ninjas and culture, all the while moving his hands with deadly accuracy for emphasis. He’s fond of using linguistic blends of speech involving the word “ninja” — “ninternships”, “ninjuice”, “ningiants”. Nichols, 31, and Sarine, 33, originally wanted to make an animated movie about a ninja. Neither could draw or animate, and money to back the show was scarce. They turned instead to the Internet and the phenomenon of user-generated content. 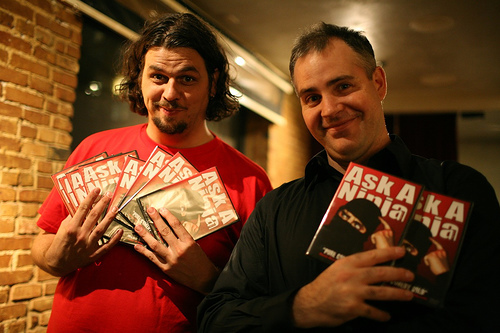 Officially starting in November 2005, “Ask A Ninja” began with about 40 subscribers but since then has turned into a branding juggernaut, reportedly earning the duo up to $300K a year. “Ask A Ninja” is downloaded between 300,000 and 500,000 times when a new episode is released bi-weekly. Popular shows such as “Ninja Love” tops more than 3 million viewers. In the past year, downloads have reached more than 20 million, catching the attention of traditional media. Hollywood has inquired, and the Ninja team — formally known as Beatbox Giant Productions, LLC — has organized a team to explore offers. Nichols and Sarine have sold a book, tentatively named “The Ninja’s Handbook”, to Random House’s Crown Publishing unit for six figures. It’s due in 2008. NPR has reported on the Ninjas as well. Capitalizing on the show’s success, the “Ninjeers” have opened their own Ninja Mart Store, selling shirts for guys and girls, hats, and ringtones. They’ve released the first 40 episodes on a DVD for $20. And the Ninja community is growing, as fan films are also showing up on the web. So I highly recommend “Ask A Ninja”, not because I am being threatened by a Ninja, but because I like it. And Ninjas are more fierce than pirates or vikings. 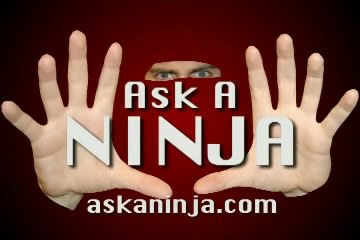 “Ask A Ninja” is available at the iTunes Music Store, on YouTube, and at the “Ask A Ninja” website. It’s available in Quicktime and Flash formats. Wow—I had no idea it had gotten that big. Certainly I’ve enjoyed the episodes I’ve seen. I love the sheer randomness of it! I have to confess, I’m yet to check them out. That’s set to change this weekend. I dropped over there real quick and watched two episodes. They were pretty funny, but also a complete waste of time. I’m ambivalent about them at this point. I’m not sure if they were funny enough to compensate for my wasted time – I’ll have to watch more I guess over the next few days and see how I feel.